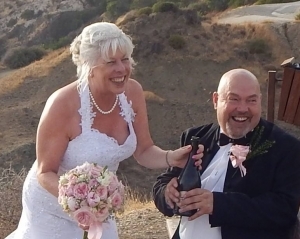 Coming up to New Year, not wedding season just now, but for Bernadette and Graham Fee it was the perfect time to get married. Staying at the Elysium hotel and marrying at Paphos town hall, they had a romantic wedding just to two of them on the 30th December 2013. I was my pleasure to arrange and very much be a part of their big day. I wish them a wonderful marriage together, health, wealth and much happiness.